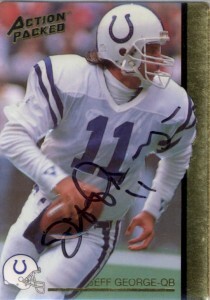 I sent out for Jeff’s autograph as part of the Colts Blitz in 1992, where he managed to stamp my cards and send me a special insert autograph. The ink pooled and the stamp was really bad on my Action Packed Rookies and ProSet card. I was not happy about it, but put them in my collection anyway. 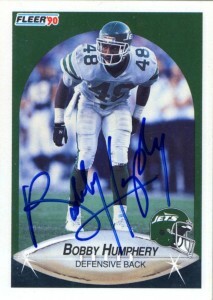 Years later I’d get his autograph on a card at Cowboys training camp in 1997 when he was with the Raiders. I decided in 2010 to send out for him. He always had some killer cards that I liked and I heard he was an exceptional TTM signer. 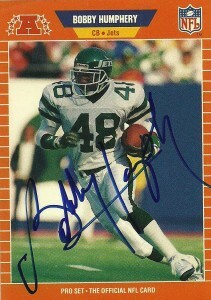 I decided to send Action Packed Rookies 1990, ProSet 1990, and a Score Supplemental 1990 for him to sign. George had some great cards, (Fleer 1990 and Score 1990 were also some great looking finalists) and it was a really hard decision on what to send but I was just happy to get these cards signed that looked like black eyes in my collection for so long in such a short amount of time. He also included another special insert card, which was exactly the same as the one picture above from 1992, validating that it was indeed a print. 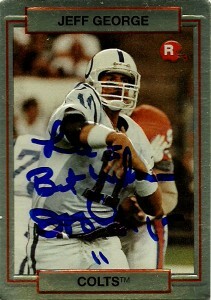 With a cannon for an arm Jeff George is one of the most prolific passers to come out of the University of Illinois. Almost coming out of nowhere in to lead the class of 1990, George had the Colts salivating to get him. The problem was, the Falcons held the #1 overall pick. 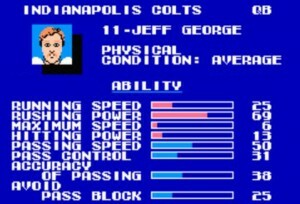 Led by crafty coach Jerry Glanville, he and his staff exploited Indianapolis’ interest in George and fleeced the Colts, getting T Chris Hinton, WR Andre Rison, and the Colts #1 pick in 1991 all in exchange for the rights to draft Jeff George #1 in 1990. The hype machine worked as the Falcons had Hinton and Rison as building blocks to propel them back into the playoffs for the first time in almost 10 years. The Colts felt they were one player away with the deal and while things looked optimistic early with George under center- everything else went backwards. His rookie season was actually quite good, as Jeff threw for 16 TDs, 13 Int and 2100 yards; However, playoff pressure continued to mount over the next 3 seasons. In 1991, the team collapsed to a 1-15 record. 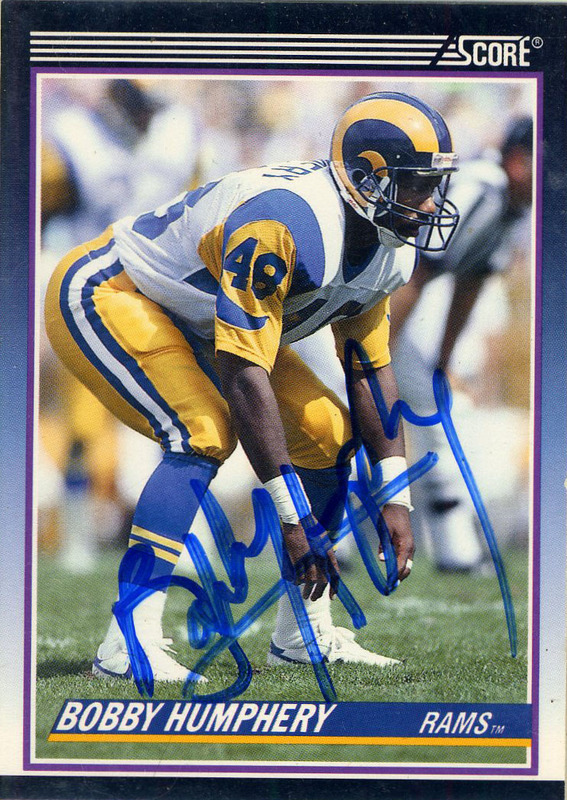 While George would remain consistent, with injuries and holdouts piling up on Eric Dickerson at runningback, teams began to key heavily on Jeff. -He was sacked a league leading 56 times. 1992, would be an injury plagued year for George. I remember against the Oilers, that season, George did not start due to injury. The Oilers dismantled Colts quarterback Jack Trudeau. Forced to start Tom Tupa for the remainder of the contest- the Oilers then knocked him out of the game. George came in under center on the last series and on the first snap- unprovoked- Sean Jones came across the line offsides and dropped George. George got up woozy and this is basically how the last 3 seasons went in Indy for the maligned quarterback. 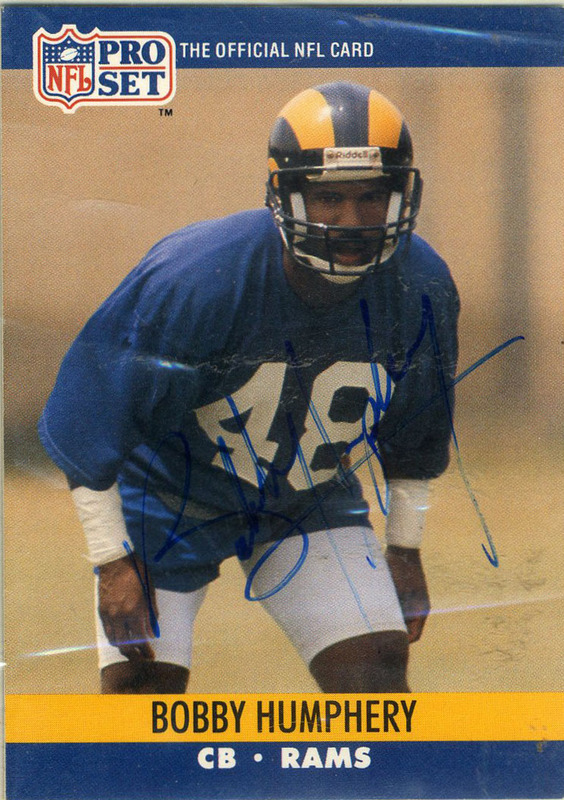 Despite throwing 7 touchdowns to 15 interceptions, George appeared to be on his way up and the team finished 6-4 with him under center starting 10 games battling injuries in 1992. 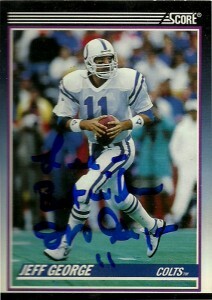 1993 would return the team to a the downward slide, and by season’s end George would be the black sheep of Indianapolis. Once the heralded savior of hometown Indianapolis- George was rode out in the middle of the night in 1994 in a trade- ironically to the team that sold the Colts the bill of goods in the first place- the Atlanta Falcons. The Falcons era of George’s career was impressive. 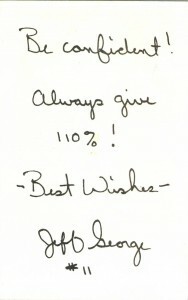 Jeff was allowed to blossom into a gunslinger in the Red Gun offense under coaching guru June Jones. 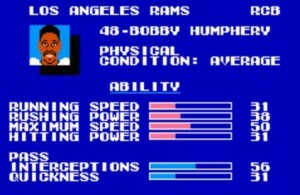 He’d have a breakout season with career highs in nearly all his passer categories in 1994. It appeared as though a change of scenery was all Jeff needed. In 1995 he’d top his previous season’s numbers. It would be his second season in a row with 500+ attempts and a qb rating of 89.5. Unfortunately in 1996 George and Jones had a nasty exchange on the sidelines that was caught on camera. Jones reacted by benching George for the remainder of the season- something that Jones in retrospect has come to acknowledge may have been a mistake. From there George garnered an unfortunate moniker as a cancer. He’d be dealt to the Raiders in 1997 where he again got the chance to redeem himself. Al Davis loves himself his speed. He also loves gunslingers- and George fit this bill to the T. Embraced by the Raiders George came out and had one of his finest seasons leading the league with 3917 yards passing, 29 touchdowns, 7 interceptions, a 91.2 qb rating, but was sacked again a league leading 58 times. He’d throw 500 or more attempts for the 3rd time in his career. 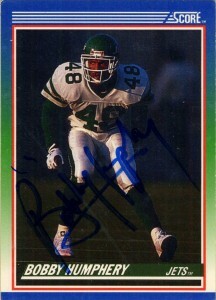 I’d get his autograph in training camp that season where he signed my Action Packed 1992 card. A cool guy, he signed stacks of cards for fans. 1998 would be an injury plagued season for George, and he’d be bounced after the season. He’d sign a free agent contract with the Vikings in 1999 and again reinvent himself under Dennis Green with another fine season, throwing 23 touchdowns and a gaudy 14.7 yards per throw (to up and coming wide receiver Randy Moss) in 10 games. He’d sign with the Redskins the following year as a backup, but would see starting time through the season as starter Brad Johnson would either be injured or ineffective. In 2000, he’d be named the defacto starter under new head coach Marty Schottenheimer, but only lasted 2 weeks in Marty’s more play action oriented offense- thus beginning the journeyman phase of George’s career. In 2002, after sitting out nearly a year and a half- there’d be a Jeff George sighting in Seattle as an emergency quarterback. He’d show up again in 2004 as a backup in Chicago and in Oakland again in 2006- (reunited with Randy Moss) but never see playing time in any stop. George has not officially retired, and at this time remains in ‘playing shape’, ready to take the reins up to play quarterback at the ripe age of 42. I suggested to him playing a season in the UFL to prove his worth to a team but did not receive a response from him. He continues to make occasional radio and TV appearances, and has from time to time received attention from the league in tryouts but has been unable to secure a roster spot on a team. In the meantime he remains active with his charity for women’s awareness for breast cancer and has made an appearance on Spikes “Pros Versus Joes” . Below are his statistics and a few videos on George, including an amazing workout circa 2009. After setting a variety of receiving records at Baylor University in Waco, Texas, Gerald McNeil went undrafted out of college because he checked in at a tiny 5″7′, 145. Undaunted Gerald was picked up by the NFL’s fledgling competition, the United States Football League, where he played for the Houston Gamblers in 1984-1985 as one of offensive coordinator Mouse Davis‘ Mouseketeers. In the run and shoot offense (with Jim Kelly as his quarterback) Gerald snagged 58 receptions for 1017 yards, a 17.6 average and 6 touchdowns. 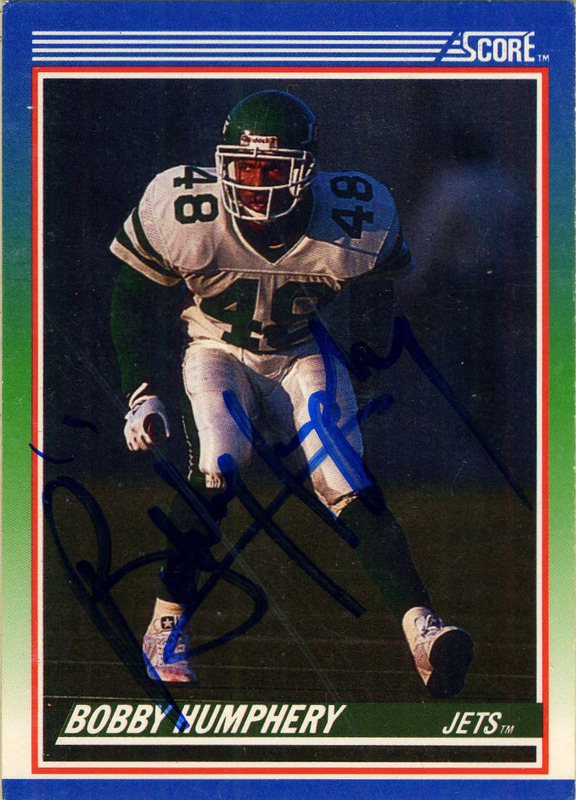 He’d be named to the USFL’s All Star Team as a punt returner by the Sporting News. 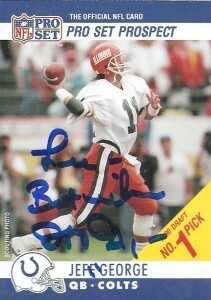 After the USFL disbanded, McNeil was drafted in the NFL’s supplemental draft by the Cleveland Browns. Electrifying fans with his speed, McNeil was nicknamed ‘Ice Cube’ due to his tiny stature and incredible elusiveness. In 1986, during his first season with the Browns, McNeil returned both a punt (84 yards) and a kickoff (100 yards) for a touchdown. 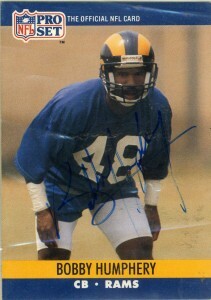 Gerald was primarily used as a return specialist during his career and earned a Pro Bowl nomination for his electrifying play in 1987. After finishing first in punt returns with 49 in 1989, Gerald was signed via Free Agency by the Houston Oilers in 1990. They hoped that he would duplicate his performance in the USFL and spell one of the Fab Four when they needed a sub, plus Bud Adams always enjoyed taking swipes and divisional competition. 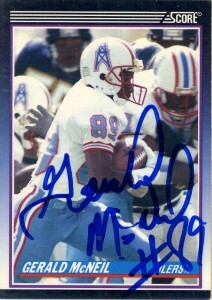 Gerald continued to be the primary punt and kick returner and get some spot playing time in his final season, retiring as a Houston Oiler after the 1990 season. 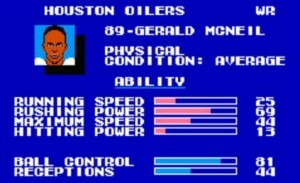 I got Gerald’s autograph at training camp that season while he was on the Oilers. Yes he was small- and a really nice guy. He had not seen his Score 1990 Supplemental card before and asked me if I had an extra. (It was the first time a player had put me on the spot like that.) Flabbergasted I told him I’d send him one. Back in those days though without the internet, it was hard to track down singles. I was able to get the card, but he retired before I was able to get it to him.